Do you have photos, historical accounts or other items pertaining to the Backus area? Would you like to share this historical information with the world? LakesnWoods.com would like to publish your Backus photos (current or historical) or historical accounts on this website. Original materials can be returned and your privacy will be respected. Backus is a city in Cass County, Minnesota. 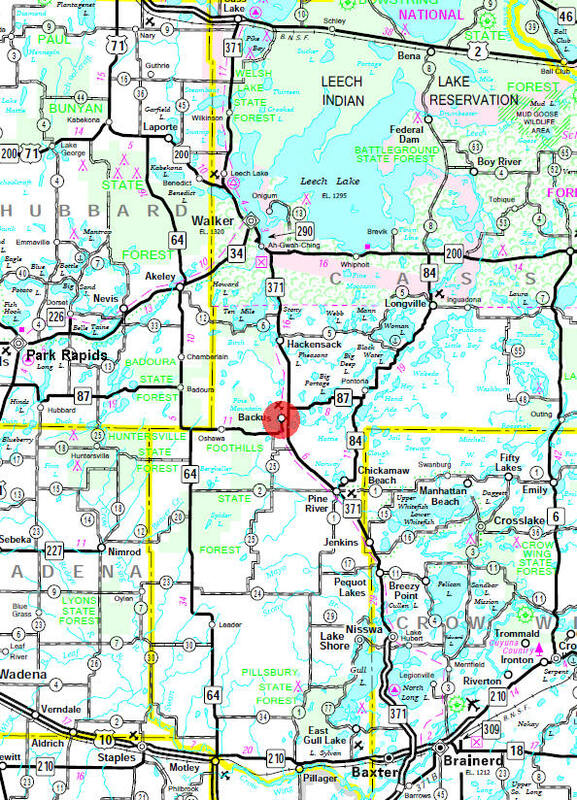 Minnesota State Highways 87 and 371 are two of the main routes in the community. According to the United States Census Bureau, the city has a total area of 0.61 square miles (1.58 km²), all of it land. The elevation is 1,345 ft (410 m) above sea level. As of the census of 2010, there were 250 people, 112 households, and 62 families residing in the city. The population density was 409.8 inhabitants per square mile (158.2/km2). There were 183 housing units at an average density of 300.0 per square mile (115.8/km2). The racial makeup of the city was 94.8% White, 0.8% Native American, 0.4% Pacific Islander, 0.4% from other races, and 3.6% from two or more races. Hispanic or Latino of any race were 0.8% of the population. There were 112 households of which 26.8% had children under the age of 18 living with them, 38.4% were married couples living together, 12.5% had a female householder with no husband present, 4.5% had a male householder with no wife present, and 44.6% were non-families. 33.9% of all households were made up of individuals and 16.1% had someone living alone who was 65 years of age or older. The average household size was 2.23 and the average family size was 2.79. The median age in the city was 46.7 years. 23.6% of residents were under the age of 18; 4.8% were between the ages of 18 and 24; 19.2% were from 25 to 44; 35.2% were from 45 to 64; and 17.2% were 65 years of age or older. The gender makeup of the city was 52.0% male and 48.0% female. 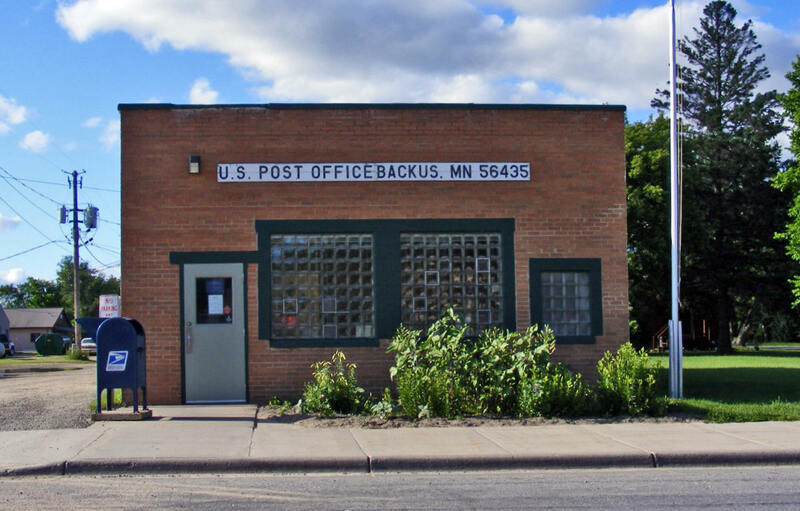 The community of Backus, located in central Cass County, took its name from one of the greatest lumbermen in Minnesota history. Edward Wellington Backus was born in Jamestown, New York in 1860, and left a country school at the age of 18 to attend the University of Minnesota. 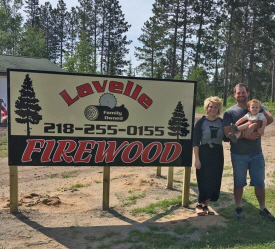 His hard work eventually led to a position with the Twin Cities lumber firm of Lee and McCulloch. Wages amounted to $9 a week, but Backus had bigger plans. As the years passed, he gained experience in the timber industry. By 1890, he had built sawmills that were the second largest in Minneapolis. In August of 1893 a fire hit the booming city, destroying 20 blocks of homes, factories and the Backus mills. With insurance money, Backus bought another mill, only to have it, too, destroyed by fire a short time later. Meanwhile, the timber industry moved northward. 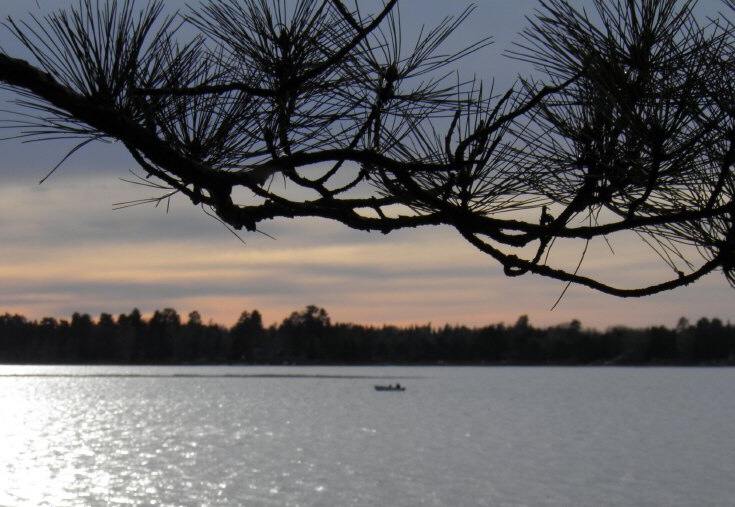 Tall pine stands in Cass and Itasca Counties attracted attention from enterprising mill owners. Edward Backus was not going to be left behind. The E.W. 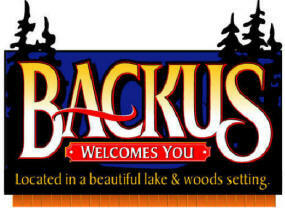 Backus Lumber Company, which later became the Backus and Brooks Lumber Company, was established in Powers Township of Cass County around 1898. Lumber camps were constructed, and nearby buildings to house employees and a warehouse were added to the landscape. As more and more families made this area their home, the settlement became a town. The community was incorporated in 1902, and appropriately, the name Backus was adopted by its founders. Edward Backus was still looking North, however. In following years, he built a dam and papermills near the Canadian border. He also added hundreds of miles of logging railroad to his new operations. Across the United States, however, the economy was seriously strained. The Great Depression arrived, and with it thousands of businesses were bankrupted. On March 1, 1931, the world of Edward Backus collapsed. The lumberman faced debts he could not pay. With only memories of a life of prosperity, he was nearly penniless. His innovative mind was still active, however, and. when he died — just two and a half years later in a New York hotel — he was planning yet another timber empire, this time in Alaska. 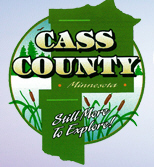 City Council meets the first Monday of the month at 7:00 pm in the City Council chambers. Second Saturday of every August. Cornfest has been celebrated since 1976 when we crowned Twyla Sycks our very first Miss Backus. 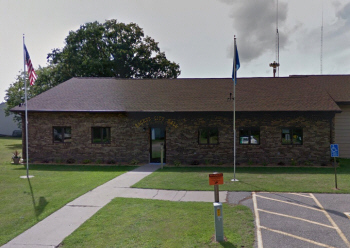 The day is celebrated starting with a flea market with many local vendors, and a lunch put on by the Cornfest Committee held in the Backus fire hall. Then there is a themed parade with prizes given in a variety of categories, followed by a corn eating contest, games for all ages, a treasure hunt, and food from local vendors. The evening is finished with a raffle drawing, a street dance with a live band and fireworks over the lake. 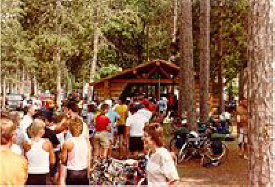 The Paul Bunyan Trail is the longest MN Bike trail at 120-miles and it connects the Heartland Trail, the Blue Ox Trail and the Cuyuna State Trail. The portion of the Minnesota bike trail from Guthrie south through Laporte toward Walker is now paved and the segment from Brainerd/Baxter south to Crow Wing State Park was paved in July 2014–providing the final paved link. With the paving of these segments, the Paul Bunyan Trail now yields 120 miles of continuously paved MN bike trails from Crow Wing State Park just south of Brainerd MN to Lake Bemidji State Park in Bemidji Minnesota! 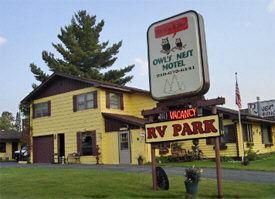 Open year round and offer Daily / Seasonal RV site rental. 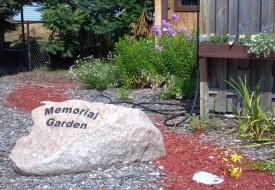 9 units that are handicap accessible, include free wireless access, & pets are welcome for additional charge. 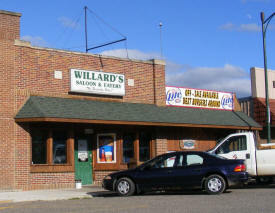 50 Miles N. of Brainerd on State Hwy 371 & 1 Block from Paul Bunyan Trail. Ada Pine Beach Resort invites you to come visit us in the heartland of Minnesota’s lake country. 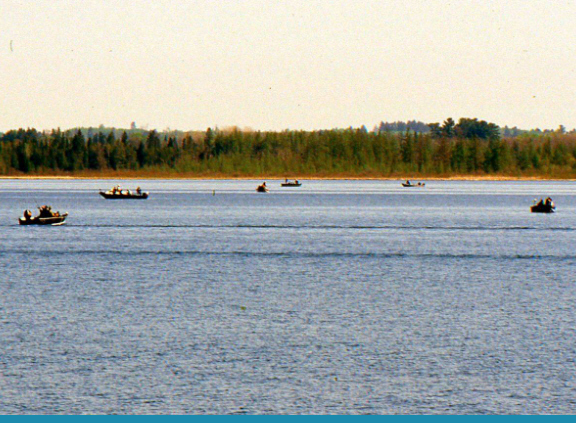 Nestled amongst huge Norway pines you can enjoy the pristine waters of Lake Ada, wonderful for fishing and recreational fun. We offer over 30 years of experience in making vacations relaxing, refreshing and memorable. 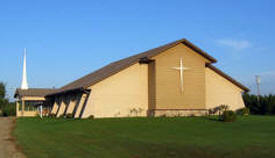 North Central Minnesota's family vacation, biking and fishing resort in the heart of Lake Country. We set out to make BaySide a special place in the sun for you. A retreat based upon the slower-paced activities and leisurely days that you knew in your childhood. A place where you can get back in touch with yourself, your family and your friends. A place and a time you'll remember and want to come back to again and again. 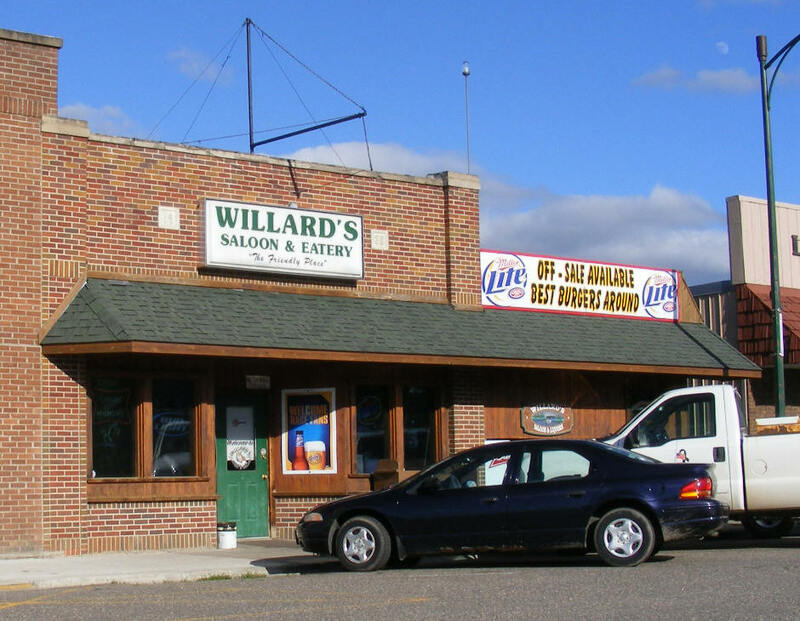 Your place in the quiet of the Minnesota northwoods. In addition to fishing, Mountain View Resort features several outdoor activities: Basketball, Bicycles, Sandbox, Swingset, Campfires, Horseshoes, Badminton, Grills, Paddleboat and Canoe. Four RV sites on the grounds of Mountain View Resort. Each site includes water, sewer, and electrical hookups. Besides our hospitality, you and your family or friends will enjoy fishing, boating and the beautiful view of Pine Mountain Lake. Located on the southern shore of beautiful Pine Mountain Lake, Ruttgers Pine Mountain Camping Resort and Pine Mountain Cottages caters to your camping, RVing and resorting needs. 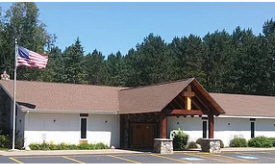 Begun in 1898 by Joseph and Josephine Ruttger in Deerwood MN, Ruttger family resorts have had a longstanding tradition of clean, friendly surroundings and most of all the famous Ruttger hospitality. Under the proprietorship of William & Candy Ruttger, fourth generation resorter, experience what Ruttger hospitality is all about!! 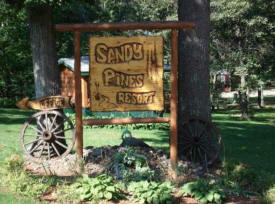 Sandy Pines Resort is open year round so that you can have an opportunity to enjoy the changing of the seasons. 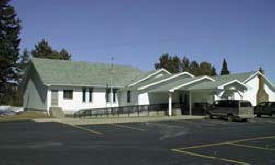 Come and enjoy your vacation at Sandy Pines Resort, which is located on Big Portage Lake in Backus, Minnesota. We have 10 acres and 500 feet of sandy lakeshore. 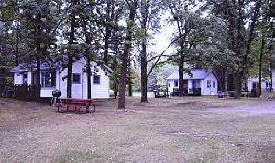 We offer Cabins at an affordable rate and well kept Campgrounds. 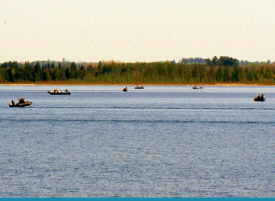 Enjoy the peace and tranquility of nature from the Deep Portage Reserve which surrounds us on the northern shores. 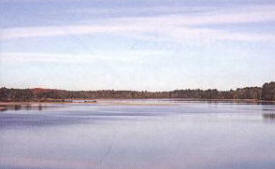 Big Portage Lake has open channels to Rice Portage, & Deep Portage Lakes. Located on beautiful Lake Hattie amidst the towering Norway pines, with wilderness trails and lakeshore for you to explore. Enjoy great fishing, hiking, a day at the beach or simply relaxing. 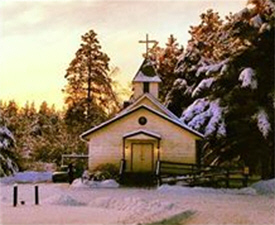 During the winter you can do a little ice fishing, snowshoeing, ice skating, snowmobiling or some cross-country skiing over the 1,800 acres surrounding the resort. Additional notes: We have 2 non-smoking cabins and 10 seasonal campsites. Located on the southern shore of beautiful Pine Mountain Lake, Ruttgers Pine Mountain Camping Resort caters to your camping, RVing and resorting needs. 33 Ranch & Saddlery is the life's work of Doug Kuschel and Jennifer Kuschel, a father and daughter leatherwork team. doug saddle2.jpg Doug started the business over 30 years ago as a sideline to full-time ranching. Doug specializes in wade saddles and strap goods, with a focus on traditional buckaroo gear. Doug still ranches with his son and wife of 42 years, Paula. They are now semi-retired and enjoy traveling and teaching cowboy traditions to the grandkids. In business since 1988, Bruce's Contracting, Inc. is a union concrete contractor, working primarily in the Midwest. Although our primary service area is Minnesota and North Dakota, there is no distance we will not travel for the right project. We focus mainly on commercial and industrial concrete and by using the latest technology and equipment combined with a skilled and experienced crew, we can meet any project requirements. 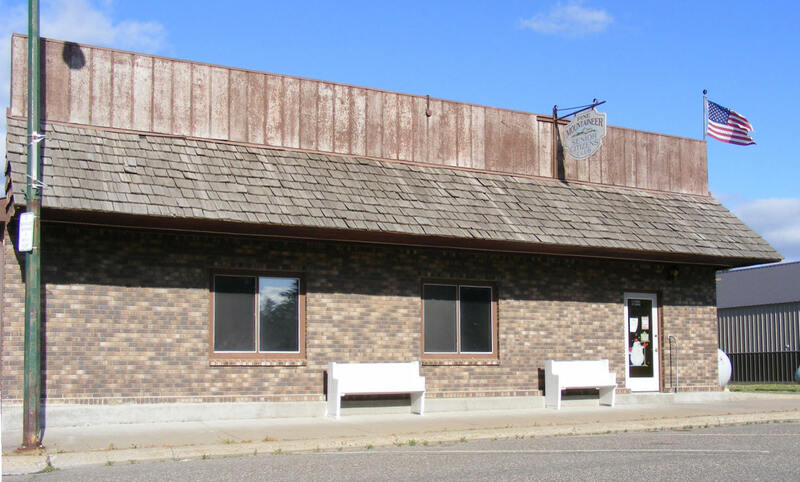 Since opening its doors in 1922 as the ‘Farmers Exchange’ to the present day, the Northern Star Coop has grown from a local group of farmers to a large business that has over 11,000 local patrons in Northern and Central Minnesota. Our main office is in Deer River, Minnesota. 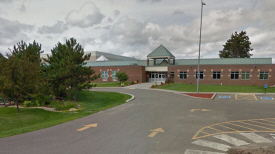 We also have facilities in Backus, Hill City, Littlefork, Long Prairie, Northome, Pine River, Remer and Walker to provide services to this large area. Day’s Sewer specializes in a variety of commercial and residential septic services including sewer line repair, septic pumping, mini excavator services, and camera line inspections. 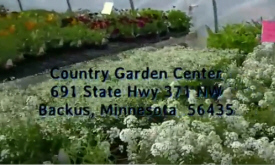 We typically service customers located within the 40 mile radius surrounding Backus, MN. 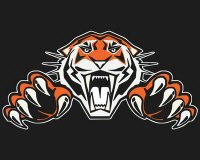 We have recently invested in state of the art digital printing equipment that allows us to print artwork directly onto garments such as T-shirts, Hoodies and bags, and produce quality limited edition canvas prints. Our online store is brand new in February 2014, but we have teamed with some of the best in the apparel business to provide quality E commerce solutions and a reliable supply chain for our customers. 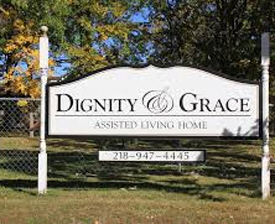 At Dignity and Grace, our residents receive high-quality care in a home-like setting, provided by 24-hour staff that truly care. We enjoy those lingering conversations around the dinner table as much as residents do! Crosslake & Grinning Bear Rolloff have been providing exceptional waste management and junk removal services for over 12 years. Count on our friendly and reliable team to help with your next cleanup project. 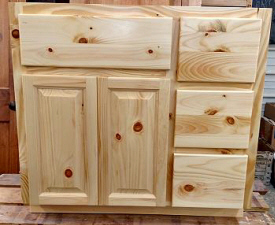 Since 1980, Henry's Woodworking has been producing outstanding, reasonably priced wood items, ranging from furniture to custom cabinets. We have more than 35 years of woodworking experience and are dedicated to creating gorgeous long-lasting wood furniture. 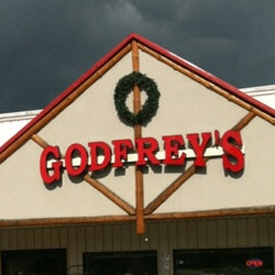 Visit our convenient location to find all the liquor you're looking for. Need something you don't see? Just ask us! We’ve been involved in both sales and installation of residential/commercial doors for a combined 15 years now at JenTra. Having seen a demand for accurate door installation, the idea of our Cheatah™ door installation tool came from our experience in the field along with a lot of reflection. 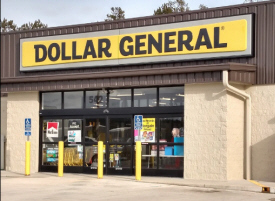 The installation of doors has been virtually the same since pre-hanging doors started sometime in the 1970’s and it is not uncommon to find poorly installed doors on most job sights, and as anyone in the millwork industry knows, poorly installed doors can cause multiple problems. 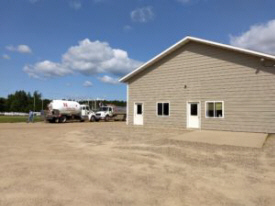 Keep Construction has been building a variety of residental products in the Backus, Minnesota area since 1984. We are committed to building high quality products in a timely and efficient manner that will fulfill all YOUR EXPECTATIONS. 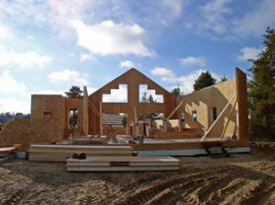 Building Homes in Northern Minnesota Since 1984! We cut and process everything from summer campfire wood to all your winter heating needs. Mike Nadeau's Street Rods & Auto Restorations provides a wide variety of professional and reliable services to the Backus, MN area. 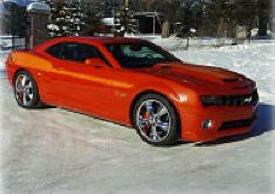 We guarantee excellent service and impeccable workmanship. 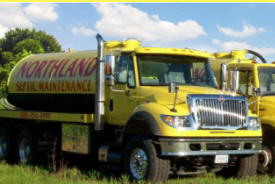 Northland was established in 1973 and has grown into a team of highly trained professionals for all your septic tank pumping, septic repair or inspection service needs in North-Central Minnesota. 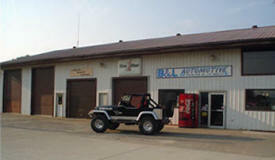 We are ready to serve you with the best equipment, best people, and best service. 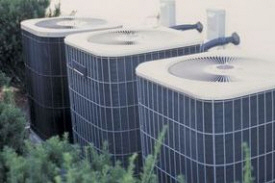 Whether your need is residential, commercial, municipal, or industrial we can help. 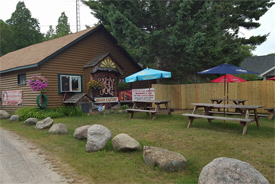 We are a small family owned resort that has been in service for almost 60 years. We currently have three cabins that we rent, two that sleep up to 6 and one that sleeps 4. 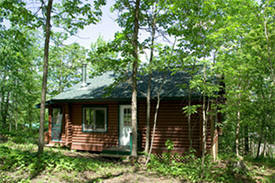 The cabins are fully equipped with dishes and cook wear and have a gas oven and refrigerator. They have double-size beds or two twins in each room. All cabin comes with a boat if you don't have your own, you just rent the motor. Just let us know when you make your reservations, otherwise there is plenty of dock space. Full-service scrap yard accepting steel, iron, aluminum, brass, copper, stainless steel, lead acid batteries and aluminum cans. The yard also is taking in junk vehicles and large appliances. 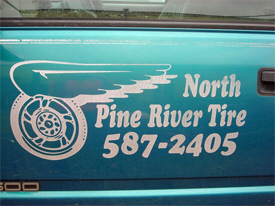 Pine River Iron and Metal reports it also will be offering a roll-off service for scrap steel, demolition waste and household garbage. Our philosophy is simple: You're in the driver's seat. We work for you. 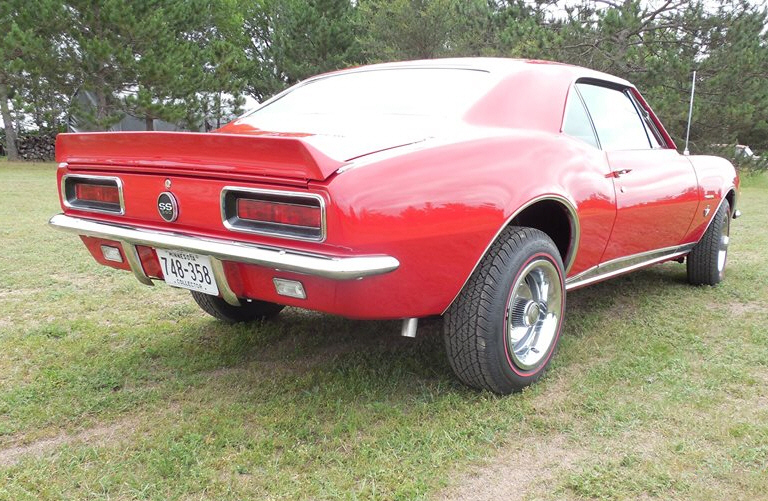 That means, whether you are looking for an award-winning custom paint job; a complete classic car restoration; custom building and bodywork; and/or performance modifications, we deliver with skill, a state-of-the-art facility, hard work, and craftsmanship. It also means, we don't stop working until the vision you hoped for entering the shop, becomes the vision you realize as you leave the shop. 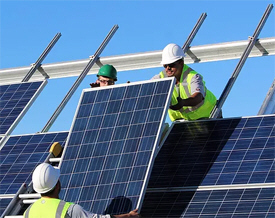 RREAL, a 501(c)(3) nonprofit organization founded in 2000, is dedicated to making solar energy accessible to communities of all income levels. We accomplish this mission primarily through our Solar Assistance program, which provides solar energy systems to low-income families and communities as a sustainable solution to energy poverty. We also offer internships, hands-on training, and workshops for people of all ages to learn about solar energy. We can solve energy poverty; solar has the power to make a difference! The log home is a symbol of our American Heritage, durable and comfortable. Now you can enjoy the charm and comfort of an authentic log home, handcrafted by skilled craftsmen with over 40 years of experience. 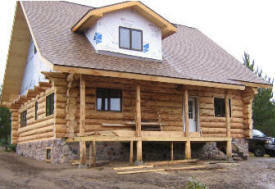 The Red Pine Log Home will blend harmoniously with all surroundings. Whether your needs are a seasonal cottage or an all season home, you can enjoy the rustic beauty and comfort of a log home. 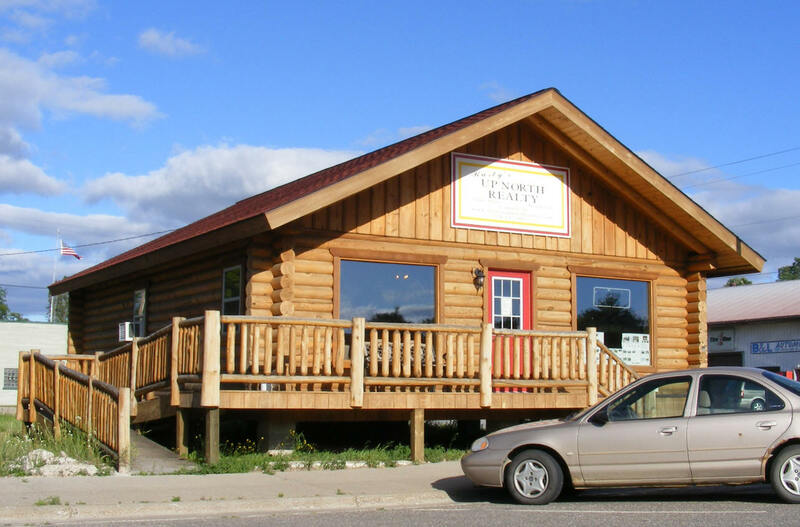 Your Red Pine Log Home begins with a custom design. Our design service will work very closely with you to establish a plan that will fulfill your needs that is unique and expressive, yet practical to construct. 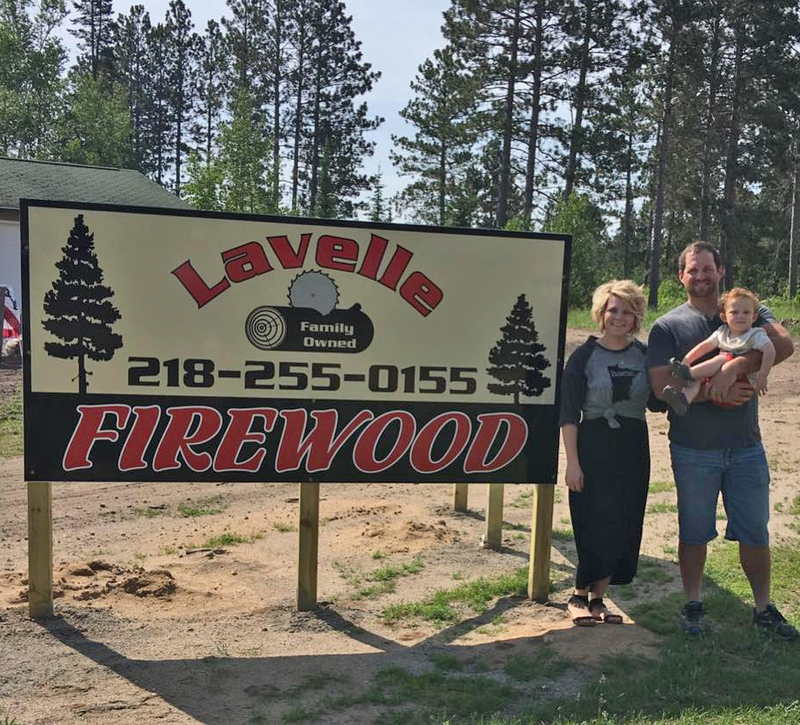 We offer friendly and reliable tree service to all our customers in the Lakes area including Backus, Pine River, Walker, Hackensack, Pequot Lakes, Nisswa, Breezy Point, Crosslake, and Park Rapids. 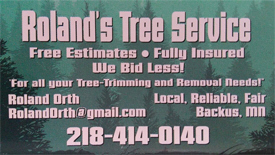 Specialize in high risk climbing, tree trimming and removal, storm cleanup, hedging, and all your tree trimming and removal needs. Rusty's Up North Realty is a full service broker offering many different types of properties. "There is no substitute for Experience"
S & E Web Design is a professional web services company located in Backus, Minnesota. We have 17 years experience in web site design, web programming, e-commerce, and web hosting. Our professional team will closely work with you through the design and development of your web site. Technical experience is not necessary! 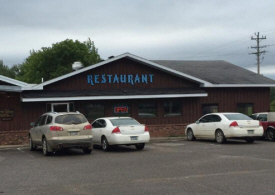 Family restaurant specializing in burgers and home smoked bbq ribs and pulled pork. Available for dine in or take out. 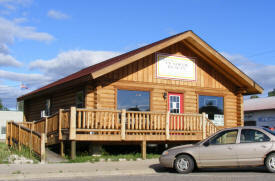 Sawyer Timber Co LLP has been providing exceptional timber services in Backus, MN. Our fourth-generation logging company is proud to provide top-quality timber products. 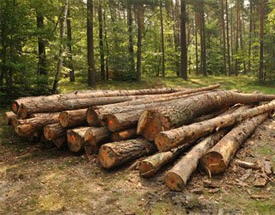 Sawyer Timber Co., LLP provides clear cut or select cut timber logs for the Backus, MN area. We also buy standing timbers of aspen, birch, oak, and more. Durable, Lightweight Travel Trailers - Scamp trailers are built to order, lightweight and aerodynamic in design. We’ve been building small travel trailers since 1972 and many are still being enjoyed today. The lightweight, hard shell fiberglass travel trailer design is very durable and easy to tow and maneuver. Towable by Small Cars - Our small campers are very economical; especially important with today’s high fuel costs. 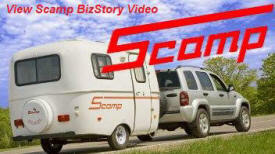 All three size Scamps have been designed to be towed by small cars, SUVs, mini vans, and trucks. The aerodynamic design assures high fuel efficiency and most people can tow the Scamp with a vehicle they already own. Your home deserves the best care you can offer it. Building, rebuilding, or maintaining, keeping your kitchen and bathrooms running perfectly is our mission. Sinks and toilets, softeners and dishwashers, we can do it all.